“The Lord hears the cry of the poor… blessed be the Lord...” Many of us know the words to that song we sing at Mass. They come from Psalm 34. The Catholic Extension team met a woman who hears the cry of the poor every day; and her life is spent helping them. We visited the Catholic Extension supported El Centro de Los Pobres (meaning, “The Center for the Poor”), in the small town of Avondale, Colorado. 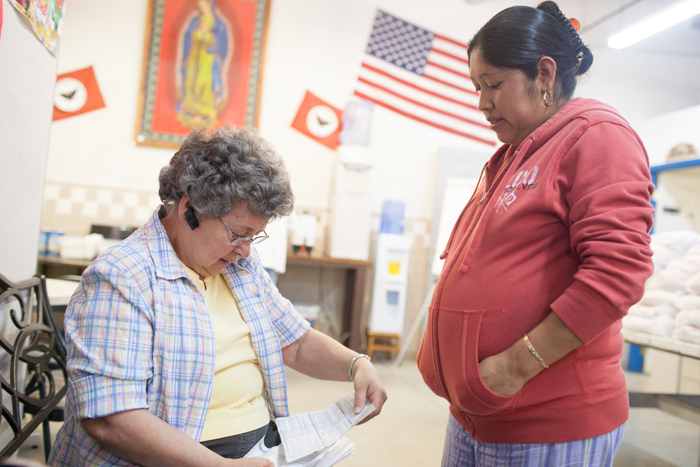 Los Pobres is the only charitable facility that serves the Catholic farm worker population in southern Colorado, many of whom don’t even have an address to put on their registration form. 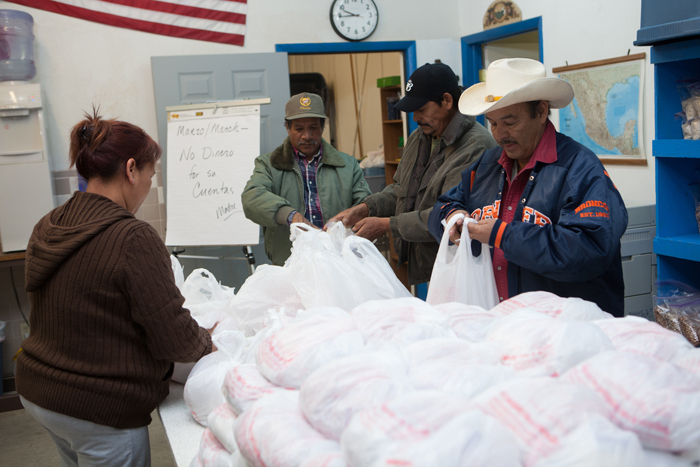 El Centro de Los Pobres provides aid to more than 5,000 families of migrant workers in the Diocese of Pueblo. The small, inconspicuous warehouse space is a haven for these workers, who bring their families on a regular basis for rice and beans, clothing, simple health services, help with bills and a safe floor to sleep on when times are at their worst. The center also provides social outreach for these visitors, acting as a voice for them in society when they have no one else to turn to. Whatever the reason for their visit, the men, women and children served by Los Pobres leave with a sense of hope. 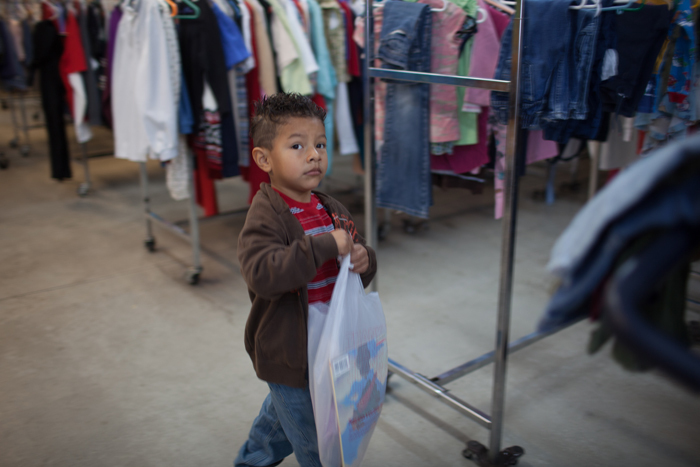 Catholic Extension has been able to help support Los Pobres through the generosity of some of our donors. Father Maurice Gallagher, pastor of Sacred Heart Church in Avondale, started Los Pobres 29 years ago. They currently have 5,000 families registered at the center. Over 200 families come to get help each week. Sister Nancy Crafton, of the Sisters of Charity, is in charge of Los Pobres. She welcomed us when we arrived; and we were immediately struck by her incredible energy and huge smile. A light seemed to shine forth from Sister Nancy. Even though Sister Nancy regularly hears sad stories (“This is not a happy place,” she said), she exuded a great sense of faith and hope. Sister Nancy loves the people to whom she ministers. Each person she spoke with was greeted with a smile. Sr. Nancy (left) with a client. Last year alone, Los Pobres provided over $100,000 in utility assistance. Sister Nancy gave us a tour of Los Pobres, which is run by an all-volunteer staff. Many local parishioners give generously of their time, and all volunteers are farm workers themselves. Though the Center is in a large warehouse, it is bright and welcoming. There is a large clothing area for families to choose clothes which have been donated. Another area is for distributing food. And there is a small clinic, where local doctors come to help these men, women and children who have no access to adequate health care, because they have no health insurance. While we were there, many of the people who came up to Sister Nancy had medical bills or utility bills in their hands. They have no way of paying them. Sister Nancy graciously took each one, and reassured them that she would help them take care of their bills. We noticed that many of the mothers and children who were visiting Los Pobres that morning were happy to see each other; not only was this a place they come to receive help, but it is also a community of support for them. Many of these women credited Sister Nancy and the center for changing their lives. The community spends a great deal of time volunteering at Los Pobres. Most volunteers are farm workers. The back of the Los Pobres brochure includes a passage from Proverbs: “He who is kind to the poor lends to the Lord, and He will reward him for what he has done.” Sister Nancy and her volunteers are kind to los pobres. We at Catholic Extension are grateful for the chance to be inspired by their faith, hope and love. — Terry Witherell, National Representative for Strategic Initiatives.